Internet Entrepreneur Andrew Hazen has acquired LongIsland.com and has big plans to take the popular website to the next level. Commack, NY - February 6, 2019 - Back in the 1990s, a lot of people saw the possibility and promise of the Internet. Some people saw the profit that could be found on the World Wide Web not simply by selling product, but also by helping others to do the same. Andrew Hazen, an early Internet entrepreneur, trained as a lawyer before deciding that the Internet itself was not so much the Wild West, but a world where companies could thrive and people could get information as well as products. Rather than just believe it, he bet on the Internet, going from law to the Web by finding a niche and a need. He in 1998 started LIBusiness.com after buying that name in August of that year. While he and others built websites, Hazen noticed something else early on. Shakespeare may have asked the question “What’s in a name?” centuries ago, but Hazen understood that in the Internet age names became crucial, since search engine rankings helped determine traffic to a site. Hazen in the late 1990s, among the Internet pioneers, quickly realized that search engine optimization - increasing search engine rankings - was the key to unlocking online sales. He changed the company name to Prime Visibility and made it an Internet marketing agency, focusing on search engine optimization. From there he went to work. “People used to hire me to get them on the first page of HotBot, Altavista, Lycos and Yahoo,” Hazen said of days before Google became the giant it is today. He grew Prime Visibility to more than 60 people and more than $12 million in annual revenue, before selling the firm in 2007 to private investors. He stayed on board, running the company for four years, until the firm was sold again in 2011 to a public company. He became and remains of counsel to Uniondale-based Ruskin Moscou Faltischek, bringing his legal, business, and Web experience to the table. 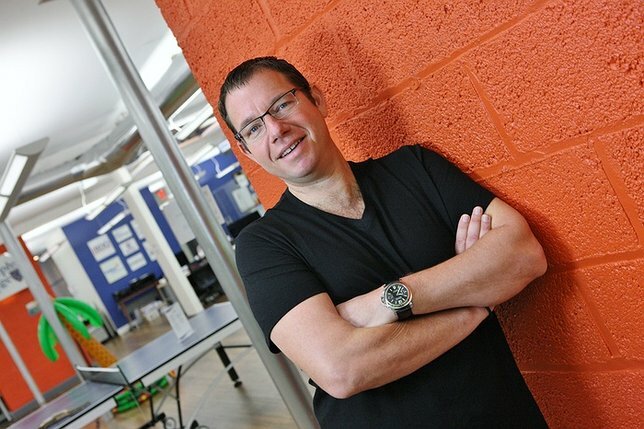 In keeping with a focus on helping and working with other businesses, he founded LaunchPad Long Island, which set up business incubators in Huntington and Mineola that help entrepreneurs take their business to the next level. In addition to those companies, Hazen built other niche businesses based on love of products that he believed were being overlooked on the Web. Hazen already collected bobbleheads and his father was in the promotional industry. He launched a business selling bobbleheads named BobbleBoss (and then PromoBobbles) that specializes in custom-made bobbleheads. He also launched BagelOfTheMonth.com, a bagel of the month club that ships thousands of New York-made bagels around the country. In 2008 after selling Prime Visibility, Hazen found out that Invision owner Tyler Roye and his partners - recently sold to Mindshift - were selling various domain names, including LongIsland.com. After seeing the value in domain names, Hazen saw a name he believed could both be key to the region...and become the basis for a bigger business. As someone who loved Long Island, Hazen saw a chance to match his skills with a domain name that could become synonymous with the region. Moving company trucks traveled down roads in the region with the LongIsland.com logo on them. And LongIsland.com began to build a brand and grow traffic with a category-killer name that Hazen believed to be a prime opportunity. A domain name broker sought the highest bidder for LongIsland.com, which went up to public auction. Hazen bid $250,000, only to be outbid by the $370,000 offer from InternetPoint.com, led by Ralph Cristello. Cristello and the team at LongIsland.com grew the site, filling it with content, ranging from events in a packed calendar to news. The site, with an easy to use back end, lets people post their events, providing a window into the world of Long Island – and a resource for those publicizing and attending events as well as advertising. A decade after the initial bid, Hazen met with Cristello, who built LongIsland.com into a successful business. Hazen noted that he remained interested in LongIsland.com, and the deal to transfer ownership of the site closed on January 23, a few days after Hazen’s 46th birthday on January 19. Subject: LongIsland.com - Your Name sent you Article details of "Internet Entrepreneur Andrew Hazen Acquires LongIsland.com"